Feature Photo & Photo Above Courtesy of Alissa Ruxin. 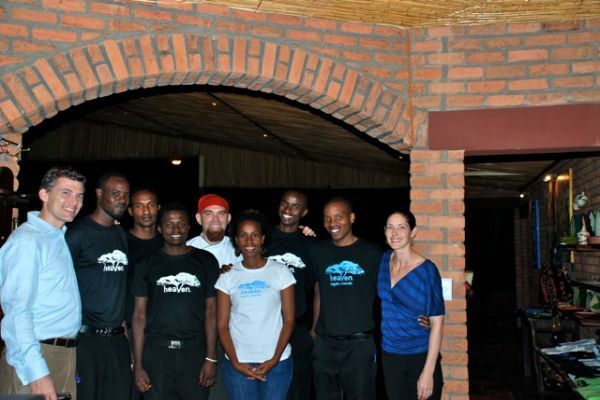 Social entrepreneur Alissa Ruxin opened Heaven Rwanda in 2008 with the intent to create opportunities for employment and ongoing vocational training for Rwandans living in the capital city of Kigali. Abbie: What makes your restaurant special? Alissa: There are several restaurants in Kigali, but none with the same social mission to invest in ongoing training in hospitality skills with the larger goal to help raise the standard in customer service and culinary excellence in Rwanda. We also build our menu on locally sourced, organic products, pay fair wages and taxes, and support local cooperatives by displaying and selling arts and crafts at our restaurant. Abbie: What inspired you to create Heaven Rwanda? Alissa: Although I studied public health and assumed I would pursue work in the health sector, when we moved to Rwanda in 2006, I spent my first 6 months volunteering with Orphans of Rwanda (now Generation Rwanda) a unique university scholarship program for orphans. Through this work, I became acquainted with so many young adults – many of whom had completed their secondary (high school) level education but did not received the grades or have the funding to pursue university education. I became inspired by my volunteer experience to start a business to create jobs and provide skills training for youth. The unemployment rate is at 75% in Rwanda, with most of the population still surviving as subsistence-level farmers. Abbie: Why does the community need a business like this? Alissa: Thousands of tourists come to Rwanda each year to visit the mountain gorillas, made most famous by the film “Gorillas in the Mist.” Unfortunately, most tourists only spend a few days in the country and spend most of their time in the volcanoes region with the gorillas, not necessarily spending time in other parts of the country or in Kigali, the capital city. Heaven was born, in part, to boost the local economy. By providing a new venue for tourists to enjoy during their stay, Heaven offers another way for customers to invest dollars into the economy. In addition, Heaven offers the local community a rotating gourmet menu and cultural events – we have a outdoor movie night every Saturday and often have traditional dance and music performances on our terrace. Abbie: Do you only hire people from Rwanda? Alissa: Our staff is 99% Rwandese. However, management continues to be our greatest challenge and though we continue to train Rwandan managers we have also welcomed Americans to help us manage the daily operations of the restaurant. Abbie: Are there any volunteer opportunities for travelers? Alissa: We do welcome volunteers but find that a longer-term commitment is more effective than short-term. That said, if a gourmet chef comes into town for a few weeks we would be more than happy to have him/her introduce some new recipes to our kitchen! For more information or to volunteer, visit the Heaven Rwanda website, or email them at heavenrwanda[at]gmail[dot]com. Do you know of a business that is make a difference within a community and is open to volunteers? Email Julie[at]matadornetwork[dot]com!